Makenzies Miracle: We Have Power! 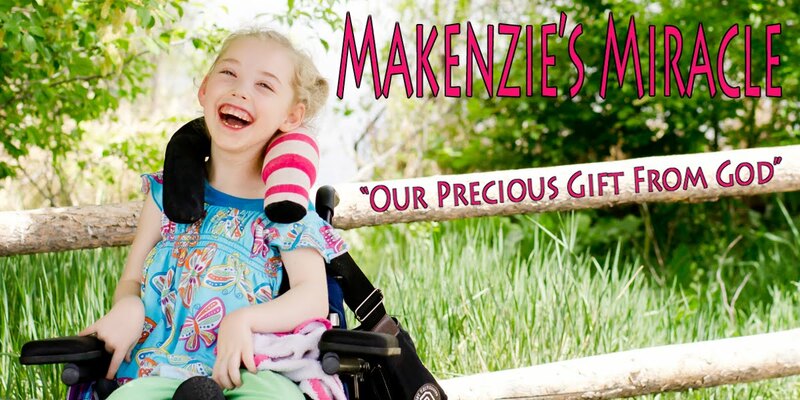 Today Makenzie and I spent about 5 hours at the clinic waiting for the finishing touches to be put on her power chair. As we sat in that overly quiet room just her and I, my eye lids got heavy and I found myself holding Makenzie just a little bit tighter. Makenzie laid perfectly still in my arms and I think we just both took in that special time together. Every once in a while Makenzie would look up and me and smile. I would look down and kiss her forehead and we would both melt back into the chair together. In that moment the crazy busy life we lead seemed non existent. My heart is so full of love for my little girl and acceptance of what happened to her four years ago. I would love for her to walk and talk. I would love for her to be able to feed herself and play barbies with her friends. I hope and pray for this healing everyday. I expect each of my four kids to grow, learn, and be everything they can be....... that includes my daughter. I have found over the last year that my hopes and dreams for Makenzie are still there. They just look a bit different. I think about what she is doing today and dream about what she will be when she grows up. The heart of this beholder believes without any doubt that it will be nothing short of brilliant! We left the clinic with a power chair that looks great! It will take some more fine tuning and the right headrest and soon enough it will be perfect. It will give Makenzie a new independence that if you had asked me about three years ago I would have told you was improbable at best. In the last three years however I have learned not to put anything past Makenzie or my God! I have BIG hopes and dreams for Makenzie and her new wheels. I can see her following me around at the store and playing ball with her brothers in the park. I can see taking walks this summer while Makenzie leads the way. I have dreams! BIG dreams! Unfortunately Makenzie did not really get to try out her new chair today. Our three hour appointment went over by two hours and once the chair was all together I was time to head out quickly. Our amazing seating guy helped us to the van and after a few adjustment to the tie downs we got both wheelchairs in the van. Makenzie was one tired little girl by the time all was said and done but she was such a trooper! When we got home all of the boys were so excited to check out the chair. I am pretty sure they see it as a really fancy go kart with lots of buttons to figure out! Mr. 14 decided that the lack of a ramp into our home was no reason not to find a way to get her chair inside. I am pretty sure I came close to having a heart attack at least 5 times as he stacked boards on top of each other to make a impromptu ramp. There were several times I had a vision of Makenzie brand new independence tipped over sideways in the snow with no way to get it back up. However nothing tragic happened and Makenzie's power chair is now residing in my living room. Mr. 14 has read the whole user manual and I am sure if he thought he could get away with it he would probably be cruising around the house as we speak! Good thing he is a smart kid and thought better of pushing his luck! Tomorrow we are not going anywhere! Snow is falling at a rapid pace and I am feeling like it is time for a day of rest and some more snuggling. The finishing touches for Christmas can wait one more day right?